I’ve been a producer at KSBW for ten years. The slide on Highway 1 in Big Sur was huge news– bigger than the hole that had just swallowed the road. When the video first came into the newsroom there was an audible reaction to the damage from the whole crew. “How in the world could anyone fix this?” we thought. And then as I was writing the story for the eleven o’clock news, it hit me… THE MARATHON! 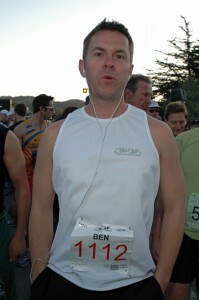 2011 was to be my sixth Big Sur International Marathon race, but this year was going to be different. For the first time, my parents were making the trip from Iowa to see me finish, and the event just happened to fall on my mother’s birthday. I knew this slide would change everything. 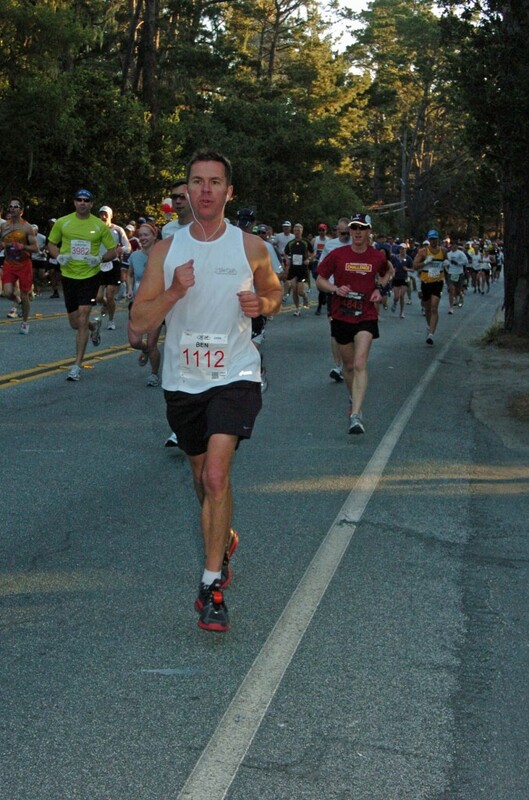 I am no grizzled veteran – there are 19 of them that have run all 26 Big Sur Marathons – but I have been around the twisty, hilly block before. The major obstacle on this 26.2 mile course is Hurricane Point. The 500-foot climb is Heaven on the eyes, Hell on the feet. Although a temporary road was in place by mid-April, race officials changed the course for the second time in BSIM history to an out and back. That meant no jog with the Devil, but in its place, 26 total hills. In order to keep it one of the most challenging courses in the country, the total number of feet to be climbed went from 1,700 to 2,400… including a jaunt through the breathtaking but difficult to navigate Point Lobos State Park. Race officials vowed that this course would be even harder. Nothing about this year’s race felt normal. Since I live in Pacific Grove, I skipped the bus and had my dad drop me off at the staging area at The Crossroads parking lot off Rio Road in Carmel – a big change from the woodsy, spiritual vibe of Pfieffer State Park. In years past, I met so many incredible and healthy people from all over the globe (all 50 states are represented, plus two dozen countries). When you’re freezing in Big Sur and stuffed into a ranger station with all 3,000+ people, you make friends quickly and easily. Again, this year was much different. With early morning temperatures just 12 degrees above freezing, some brilliant runner had the idea to incubate inside the massive Safeway grocery store. By the time I walked in, the aisles were full of people stretching and pinning on their bib numbers. I found a seat on the floor in the pet aisle and rested my head against a sack of cat food. Groups of people mingled and took photos inside the store. Everyone knew this was a one-time-only experience. 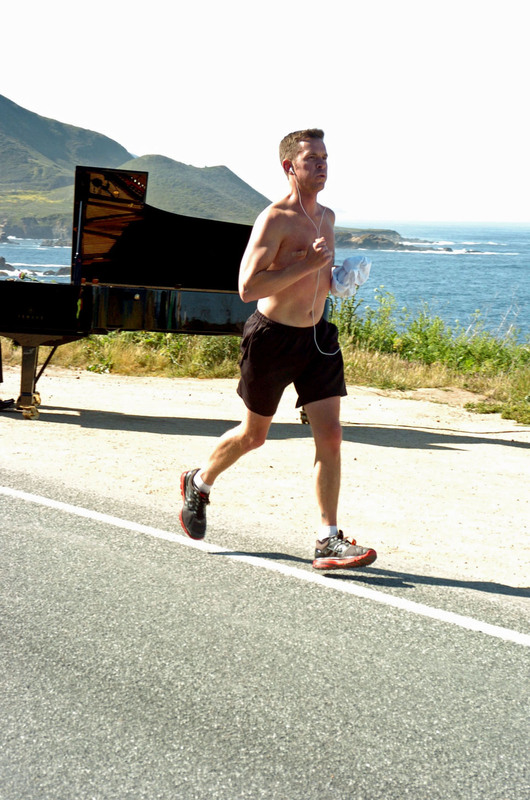 In addition to my nap on the cat food, there were other events in my life that made the Big Sur Marathon 2011 a completely different experience for me. Just three weeks ago, my wife and I welcomed our first child – a baby girl named Harper. She’s the love of our lives, and she’s cute as a button, but she has some tremendous lungs – destined to become an opera singer. So that meant three weeks of no sleep, and a lot less training. In fact, the longest distance I’d run in the last couple months was four miles. All of these realities were weighing on my mind. With thirty minutes to go before the start of the race, I stripped to shorts and a sleeveless shirt and began shivering. The announcer told everyone to make their way up onto the roadway – asking those planning on finishing in 4:00:00 or less to head to the front for the staggered start. I somehow found myself in the very front row of runners. While my best time ever was 3 hours 58 minutes, and my goal this go around was 4 hours or so, I knew I had no business standing next to these elite men and women. But I went with it anyway. With ten minutes to go, a pastor read an invocation, then the singing of “The National Anthem,” followed by the releasing of white doves, and then the gun went off. My arms were numb from the cold, and my fingers were bright red as I pumped them back and forth down Highway 1. I got off to a great start. My stomach felt fine. Breathing was good. But my mind was playing tricks on me like an old Geto Boys rap. The Carmel Highlands was supposed to be the awful climb near the end of the race – now we were hitting it just a few miles in. Not fair. Of course, the worst part was the knowledge that we’d have to tackle it again in about 20 miles. Everything seemed backwards. The main thing going for all us runners was the weather. The sun began peeking out above the mountains, and there was a gentle wind at our backs. The temperature began climbing into the sixties, and by race’s end, it hit 70. The conditions couldn’t have been more perfect. As I ascended and then descended hill after hill, my breathing was fine – although the scenery did its best to take it away. The view to the right – the crashing waves of the vast, blue Pacific. To the left – the lush green cliffs covered in spring wildflowers. While the course itself was a challenge with each footstep, the sheer beauty of it all soothed the skin. In the distance I could see the Bixby Bridge, which marks the halfway point during normal years and is a huge highlight of the race. But this year, the turnaround came at Rocky Point – about a mile before the bridge. I had tried to avoid listening to the volunteers reading off times at each mile marker, instead, focusing on the music blaring from my iPod. But at the 12.2 mile turnaround, I decided it was time to know how I was doing. 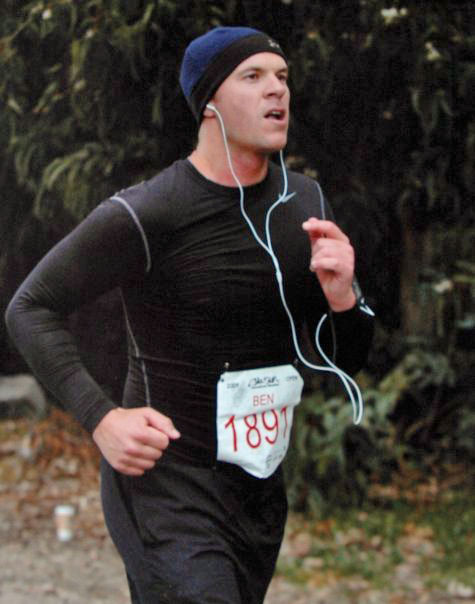 To my surprise, my pace was faster than it had ever been this late into the race. At one hour thirty-eight minutes and twenty seconds into the marathon I was averaging an 8:04 mile… on pace for a 3:30:00 finish. That wouldn’t last. At the turn we switched from the mountain side to the ocean side of the road. The wind was now in our faces, and all of a sudden my body screamed, “Stop!” I fought it. But eventually I crashed head on into the dreaded wall. It’s hard to describe, but essentially it’s when your mind, which has been overpowering the pain of your body’s matter, decides it doesn’t want to play anymore. You suddenly become aware of every small ache, and the pain in your legs is magnified to a much a higher power. And as all that is going on internally, the course decides to throw an even bigger wrench into the mix – a long, unforgiving uphill jaunt at mile 15. I fought and fought, but eventually hit the wall. From there it was a constant battle between my mind and body. I walked many of the uphill sections, while trying to stretch out my legs and run briskly on the downhills. My time slowly began to inflate. Despite multiple Gu drops and water at every stop, my energy level never really picked up this year. The volunteers, as always, were incredible, and the grand piano player along the coast is that elegant touch that’s so fitting for Big Sur. In addition, many of my fellow runners did their part to give late race pep talks to keep those legs going. The Carmel Highlands were brutal, as expected, and the trek through Point Lobos was like taking candy from a baby. Speaking of babies – I thought frequently about my newborn, and how my lack of training was so worth it. I knew she’d be waiting there at the finish line with my wife and parents. So I pushed on – hoping to make them proud. The mile markers that blur together throughout were now stark and clear. 24, 25… they read. I could smell the finish line. Just as the clock clicked to the fourth hour, I crossed the line. It is not natural for the body to run 26.2 miles. Things hurt. But it is an incredible accomplishment of physical and emotional strength. 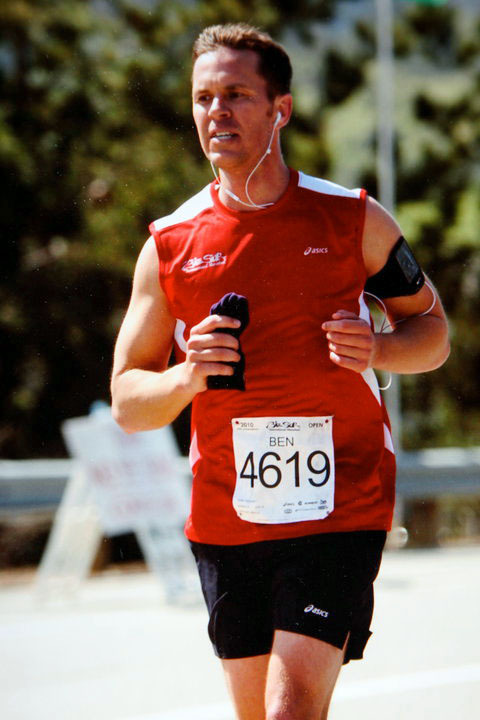 I have played sports my whole life, yet no feat has ever equaled that of finishing a marathon. It is grueling, but the final reward is so worth it. 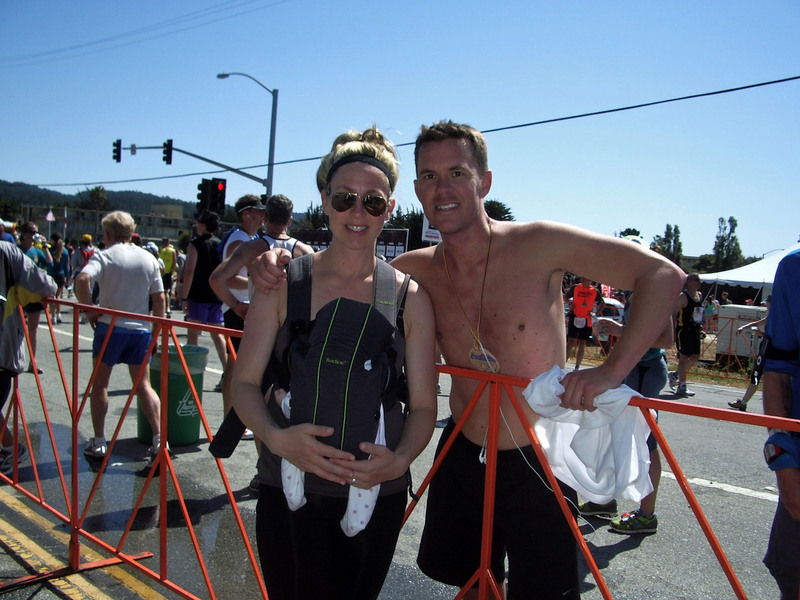 Crossing that Big Sur Marathon line brings with it a flood of feelings… joy, sadness and an overwhelming urge to hug my family. I got my medal, and then did just that. 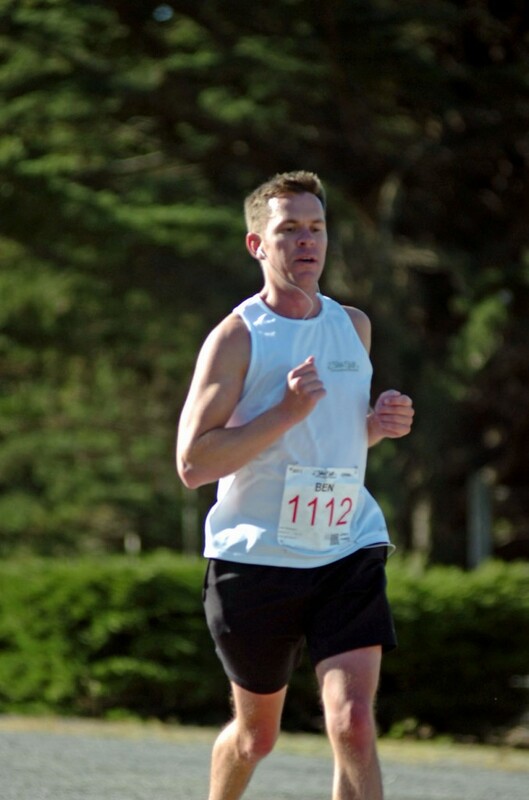 4:00:46 was my official time… that’s a 9:11 pace. An ironic number for a newsman, as later that evening as I rested my tired legs, the word broke that 9/11 mastermind Osama Bin Laden had been killed. We ate my mom’s birthday cake while watching the coverage. May 1, 2011 is one that simply will not be forgotten. It’s neat seeing you doing this marathon and I just want to say congratulations for all you’ve accomplished. I’ve been reading up on some of your work and am impressed and I think its awesome you won an emmy. Keep it up man. Just wanted to say hi and let you know that people from the neighborhood are still watching.